Azure Data Explorer is a log analytics cloud platform optimized for ad-hoc big data queries. This plugin requires Grafana 5.3.0 or newer. If you do not have a Grafana Cloud account, you can sign up for one here. Click on the Install Now button on the Azure Data Explorer page on Grafana.com. This will automatically add the plugin to your Grafana instance. It might take up to 30 seconds to install. Login to your Hosted Grafana instance (go to your instances page in your profile): https://grafana.com/orgs/<yourUserName>/instances/ and the Azure Data Explorer datasource will be installed. To make sure the plugin was installed, check the list of installed datasources. Click the Plugins item in the main menu. Both core datasources and installed datasources will appear. It is recommended that you use a volume to save the Grafana data in. Otherwise if you remove the docker container, you will lose all your Grafana data (dashboards, users etc.). You can create a volume with the Docker Volume Driver for Azure File Storage. Grafana comes with a command line tool that can be used to install plugins. Upgrade Grafana to the latest version. Get that here. Login in with a user that has admin rights. This is needed to create datasources. If the server where Grafana is installed has no access to the Grafana.com server, then the plugin can be downloaded and manually copied to the server. Extract the zip file into the data/plugins subdirectory for Grafana. Create an Azure Active Directory (AAD) Application and AAD Service Principle. Log into the Azure Data Explorer WebExplorer and connect the AAD Application to an Azure Data Explorer database user. Use the AAD Application to configure the datasource connection in Grafana. Follow the instructions in the guide to setting up an Azure Active Directory Application. az ad sp create-for-rbac -n "http://url.to.your.grafana:3000"
To create a cluster and database, follow the instructions here. Accessed from the Grafana main menu, newly installed datasources can be added immediately within the Data Sources section. Next, click the "Add datasource" button in the upper right. The datasource will be available for selection in the Type select box. In the name field, fill in a name for the datasource. It can be anything. Click the Save & Test button. After a few seconds once Grafana has successfully connected then choose the default database and save again. 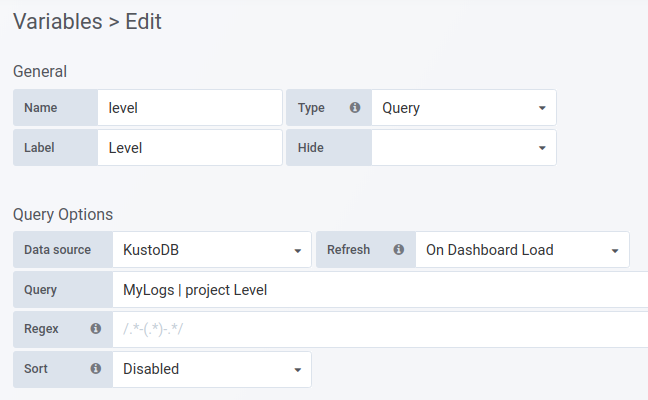 Queries are written in the new Kusto Query Language. Queries can be formatted as Time Series data or as Table data. $__timeFilter() - Expands to TimeGenerated ≥ datetime(2018-06-05T18:09:58.907Z) and TimeGenerated ≤ datetime(2018-06-05T20:09:58.907Z) where the from and to datetimes are taken from the Grafana time picker. $__timeFilter(datetimeColumn) - Expands to datetimeColumn ≥ datetime(2018-06-05T18:09:58.907Z) and datetimeColumn ≤ datetime(2018-06-05T20:09:58.907Z) where the from and to datetimes are taken from the Grafana time picker. Instead of hard-coding things like server, application and sensor name in you metric queries you can use variables in their place. Variables are shown as dropdown select boxes at the top of the dashboard. 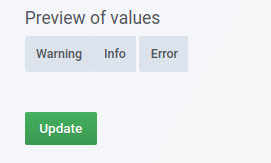 These dropdowns make it easy to change the data being displayed in your dashboard. Create the variable in the dashboard settings. Usually you will need to write a query in the Kusto Query Language to get a list of values for the dropdown. It is however also possible to have a list of hard-coded values. Fill in a name for your variable. The Name field is the name of the variable. There is also a Label field for the friendly name. In the Query Options section, choose the Azure Data Explorer datasource in the Data source dropdown. Write the query in the Query field. Use project to specify one column - the result should be a list of string values. Read more about templating and variables in the Grafana documentation. An annotation is an event that is overlaid on top of graphs. The query can have up to three columns per row, the datetime column is mandatory. Annotation rendering is expensive so it is important to limit the number of rows returned. column with the datetime type. | project Timestamp, Text=Message , Tags="tag1,tag2"
Adds an order by clause to the query if there is none specified. It uses the datetime field from the where clause or summarize...bin(). Removes the Subscription Id field from the config page as is no longer needed. Adds a config option for caching. The default in-memory cache period is 30 seconds, the new Minimal Cache Period option allows you to change that. First version of the Azure Data Explorer Datasource.